Adobe Flasher is a new iPhone app in the App Store that is about an old man named Adobe who has been busted by the police for running around town with a trench coat exposing himself (aka Flashing) ladies on the street. 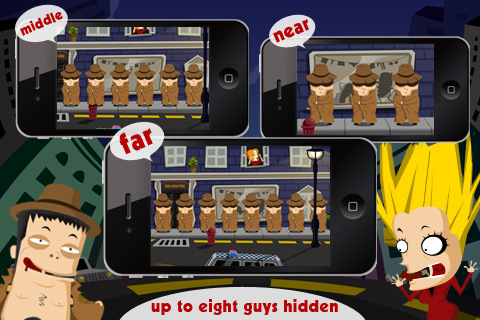 The game involves keeping a steady eye and identifying him in a police lineup. Each level starts with Adobe himself along with a few other identical looking men standing in a lineup. Adobe then flashes you showing the super tacky and weird lingerie that he is wearing under his coat. Then he closes his coat and the men start getting shuffled around on the screen. Your job is to keep a steady eye on the Adobe the flasher himself as the characters are mixed repeatedly. When they stop moving you have to tap the right Adobe Flasher and identify him. Tap the right one and you move to the next level. Tap the wrong one and its all over. As the levels go on, the number of Flashers on the screen increases, from 3 to 4 to 5 and so on, making the game more difficult. One hot lady was walking down the lonely street at midnight.Mr. Adobe ambushed in the dark,He jump out suddenly and open his coat,all his body is shown.The lady was cowed by the assault,run away for police. Mr. Adobe was going to take his heels. Come up and check him out,we should not let FLASHER goes away! Overall, Adobe Flasher is actually a pretty neat game and besides being intentionally named to create free publicity on a sore subject, it does have good playability for a puzzler. AppSafari review of Adobe Flasher was written by Joe Seifi on December 29th, 2010 and categorized under App Store, Fun, Games, Puzzler. Page viewed 3958 times, 1 so far today. Need help on using these apps? Please read the Help Page.